Is your rotary cutter getting dull? To re-sharpen your rotary cutter, fold a piece of tin foil into several layers. Cut through it several times and your cutter will be sharper again. Works great! Print or Solid? There are least two schools of thought about backing fabrics. One preference is to choose a fabric that will showcase the stitching on the back and then in effect your quilt is “reversible” as in Figure 1 where the quilt is stitched with white in the blocks and pink in the sashing and borders. If you want stitching to show on the back for a “reversible quilt,” think about thread colors that will work well on both front and back. Pieced - Makes a “reversible” quilt and / or uses up left-over fabric. 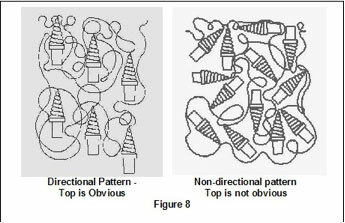 Figure 3 shows the back & Figure 4 shows the front of the same quilt. Calculate the size needed for the quilt back. Choose which way you will piece the back if seaming is required to make the back large enough. NOTE: All quilt backs can only be centered one way when placed on the machine; horizontally or vertically, but NOT both. To center a seam, it must be placed perpendicular to the rollers when mounted on the machine. See Figure 5. Single center seam – This seam can run either horizontally across the width of the quilt or vertically, parallel to the length of the quilt (see Fig. 6). Single width of fabric for the center section with remainder evenly spaced on either side. Again, these seams can be oriented either horizontally across the width of the quilt or vertically, parallel to the length of the quilt based on personal preference or the best use of fabric. Example: If your quilt back needs to be 80” wide, use the 42” width of fabric in the center and put a piece 19” on either side to equal the total width needed. NOTE: these measurements do not take into account the seam allowances (see Fig. 7). Press fabric as needed before cutting and piecing the back. Use ½ inch seam allowances for stability when piecing the back. Press seams to one side when using regular weight cotton type quilting fabric to prevent stress on the seam. When using bulky fabrics such as fleece or minkee you may wish to press the seam open to distribute the bulk. Square backing AND batting. Both should have 90 degree corners. Mark the “TOP” of the backing on the right side* so any seam(s) on the back or directional backing will be oriented the way you wish in relation to the “TOP” of the quilt. Fold backing carefully to minimize wrinkling. Place on a plastic hanger with your quilt top if you are delivering it to us; or place carefully with the top if you are shipping. *The viewable surface when quilt is completed is the right or outside of the back. Does the top require backing larger than a single width of fabric? For example, if your quilt top measures 58” x 80” the back needs to be at least 66” x 88.” This is larger in either direction than a single width of fabric, (most stretchy type fabrics are 58” – 61” wide) so the back will need to be pieced. 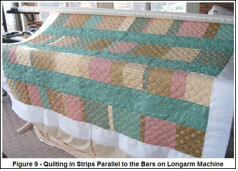 Determine how the quilt top will be oriented on the machine when it is stitched out. Seam using a ½” seam allowance. Press Seams open. The rest of the back usually will not require pressing when using a stretchy fabric.